The dashboard view is the home page or first view when the the App opens. It is divided in two diferent sections or areas. The upper side contains some graphical information and the lower side contains the list of currently in progress inspections you are working on. Gauge - In Progress This graph shows the current number of In Progress inspections. Cauge - Completed This graph shows the number of all Completed inspections. 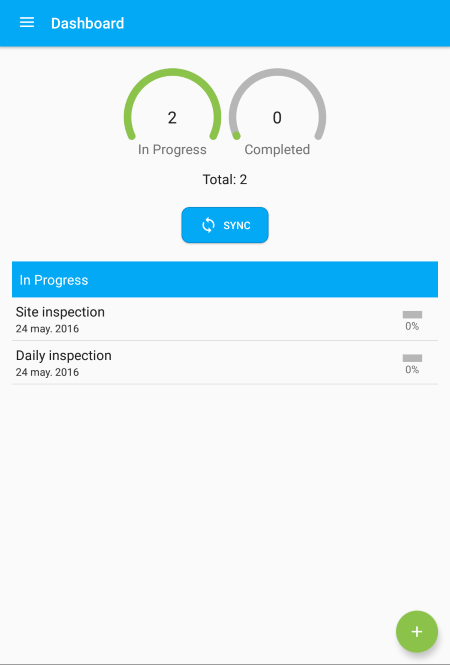 Total In Android devices, this indicator shows the whole number of inspections in the device. It includes all three inspections' status: open, completed and rejected. For iOS devices, this button is located in the menu. Lower Side This shows the list of the current in progress inspections. Tap on a row to enter and work with the inspection. 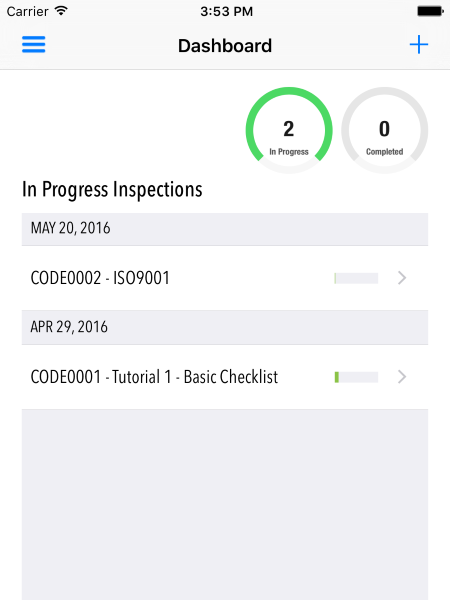 Swiping left or right on each row will show additional actions you can execute within the inspections. Android Swiping right the row to get a PDF report. Android Swiping right the row to lock the inspection, setting it as completed. Swiping left the row to delete the inspection.